H.E.L.P. Ministries of Troutman - Get Involved - Ways to Get Involved! *We hope you have a passion where you feel led to serve in one of our ministries. Take a minute to read through them listed below and please call or email us if you have a desire to serve thanks! Lunch Box: A week-day meal delivery to shut-ins and offering a time of fellowship by talking with them. Right now different churches in our community rotate by serving one week each month. Always could use an extra hand though. Wood Ministry: Provides resources for heating purposes. The wood we offer is kept at St. John's church in Troutman so someone in need can just drive over and pick it up or call and will deliver it. So we need people willing to donate wood or cut/split wood and possibly deliver wood if you have a truck or suv. Your efforts would be greatly appreciated! Good Samaritan Fund: Assist people struggling financially with utility bills, medicine bills or gas for vehicle to get to work. We now have the option if you would like to make a donation online that goes to Help Ministries for a mission like this. Neighbors Loving Neighbors: Provides indoor/outdoor repairs & service work for anyone with a need. 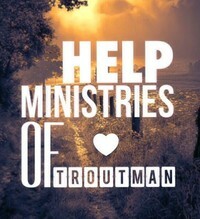 Anyone with a skill like electrical, plumbing, carpentry work, etc..We could defiantly use your help in this ministry. Food Bank: This is a food shelter for anyone or any families in need. Troutman Holy Trinity Lutheran Church is the new location for this ministry that is offered to our community. They could always use an extra hand helping stock up the pantry and even handing out the food. If you have any extra canned food or non perishable food items you would like to donate that would be a great blessing as well.